Nearly a century in the making, the Basilica of the National Shrine of the Immaculate Conception has been a work in progress since the laying of its foundation stone in 1920. This great Marian shrine, dedicated to the patroness of the United States, is a testament to the faith and generosity of generations of American Catholics. Now, as the 100th Anniversary approaches, a monumental effort is underway to complete America’s Catholic Church, according to its original plan, with the ornamentation of what will be the crowning jewel of Mary’s Shrine, the Trinity Dome. 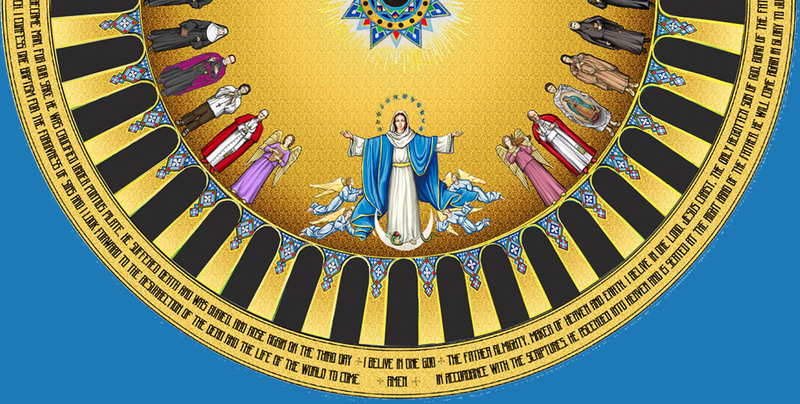 According to the original iconographic scheme,the Trinity Dome will be adorned in mosaic and depict the Most Holy Trinity, the Blessed Virgin Mary, and a procession of saints. The Nicene Creed will encircle the dome, while the four Evangelists, Matthew, Mark, Luke and John, will be featured in the Dome’s pendentives. Pope Francis arrived at the Basilica of the National Shrine of the Immaculate Conception on September 23, 2015, a picture perfect day with sunshine, blue skies, and a crowd of 25,000 faithful to greet him. As the Holy Father approached Mary’s Shrine in the Popemobile, the bells of the Knights Carillon rang jubilantly and thousands on the front steps of the Basilica welcomed him. Before entering the National Shrine, Pope Francis drove not once, but twice through the crowd on the Basilica’s East Side where the Canonization Mass of Junípero Serra would later be held. The detour back through the crowd was not according to plan, and the unscheduled second pass-through was a surprise to security. However, given the Holy Father’s penchant for spontaneity and his love of people, perhaps it shouldn’t have been such a surprise after all. The general concept governing the iconographic scheme of the entire Shrine was outlined and established by the first Iconography Committee (1954-1958), chaired by Patrick Cardinal O’Boyle (1896-1987), Archbishop of Washington, John de Rosen (1891-1982) art consultant, and composed of scholars in ecclesiastical art, scripture, theology, and Mariology. In 2006 and 2007, the north (Redemption) and south (Incarnation) nave domes were completed, respectively. Each dome contains 3,780 square feet of mosaic and rises to a height of 100 feet. The Great Trinity Dome, situated at the center of the cruciform Upper Church, is almost five times the size of one of these domes with 19,673 square feet, rising to a height of 129 feet.